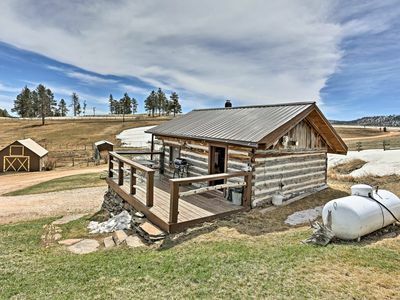 Historic CABIN #5 dates back to the Tin Mining days in Hill City. 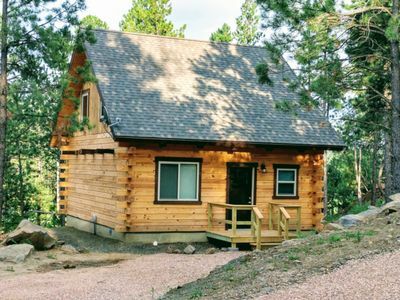 This is the real deal, a very unique Black Hills experience. 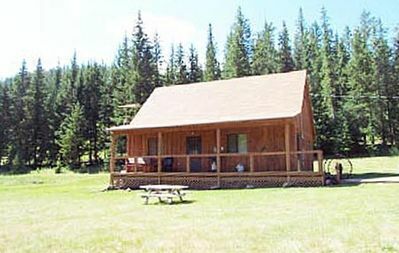 Cabin #5 is one large cabin with one bedroom and 2 bathrooms, approximately 750 sq. ft. Over 100 years old, this cabin has walls covered with bark facing, decorated with the rose-crucifiction, which was the original design of Black Hills Gold. 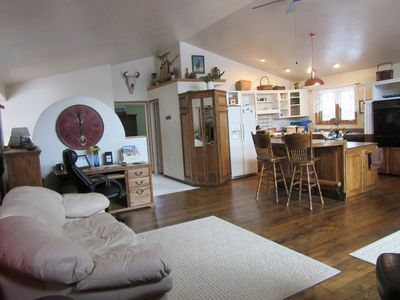 It also features a stone fireplace with wood burning stove insert. The main cabin is one large room with the sleeping area divided from the kitchenette/living area by two log-type bookcases. The kitchenette has a microwave, electric skillet, chef's pot for boiling or slow cooking, toaster, coffee maker and 2 under counter refrigerators. 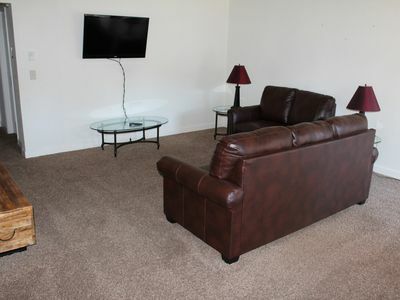 The tv is in the kitchenette/living area of this unit which also has a full size futon sofa bed. 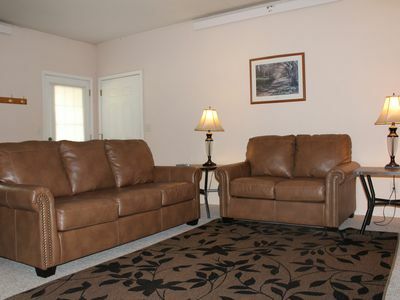 The attached bedroom has its own bathroom with tub & shower and 2 queen size beds. The sleeping area has 2 single beds, which can be converted to a king size bed upon your request, and a bathroom with shower. 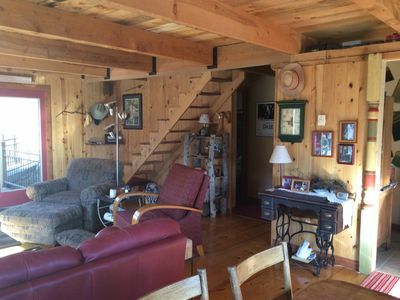 The floors of this old cabin are a bit unlevel. 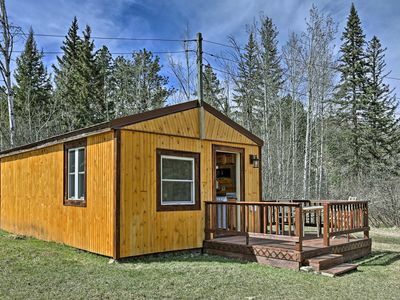 This cabin features an 8x24 foot covered front porch. 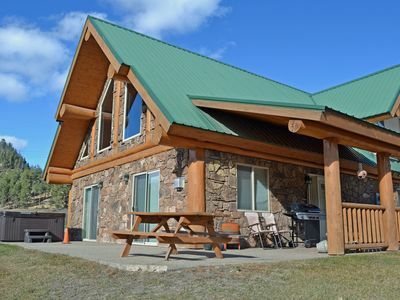 For your comfort, safety and satisfaction we do not book more than the maximum occupancy listed for the cabin. 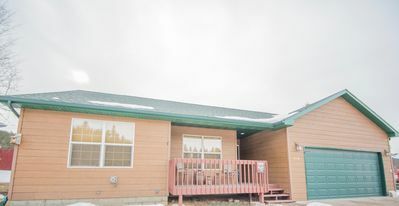 Keep in mind these occupancy numbers are intended for a combination of adults and children - the cabin will be quite crowded if you choose to fill it to the maximum capacity with adults. The futon is best suited for children. Summer days are generally cooler in the hills with temperatures in the 70's and 80's, while nights can get as low as the 30's, so it is wise to bring sweatshirts and jeans as well as your summer clothes. You will be glad you brought comfortable shoes for hiking and walking. A bathing suit is required for use of the hot tub and sauna or if you plan to visit an area pool, lake or waterslide park. 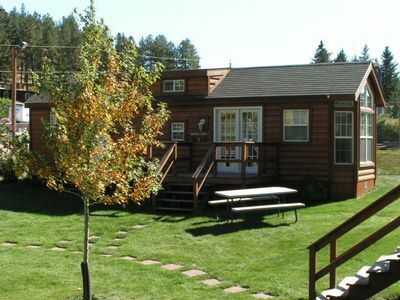 Our cabins are nature cooled, but fans are available should nature need a little help. 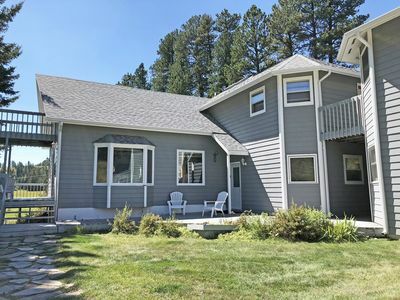 With the windows open you will breathe fresh mountain air and wake to the scent of pine. Resting on the shady side of the mountain at approximately 5000 feet above the sea level, heat and humidity are usually held in check and the cabins have good ventilation. We leave most of the cooking up to you, however you may want to come up to the Perky Pine Cafe in the morning to see what we've baked up - the coffee shop also has a variety of granola & protein bars including gluten free options. Gourmet coffee beans and a variety of Native American tea's are available for purchase at the Perky Pine . The kitchenettes are equipped and you'll find everything you need in the way of groceries at the local shops and grocery store right in Hill City. If you'd prefer to dine out, we'd be happy to refer you to some of our favorite eating places or peruse the menues we keep on hand in the lobby/coffee shop. 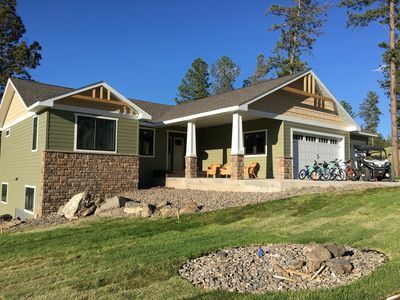 Feel free to truly hike and explore the natural beauty of the Black Hills National Forest directly adjoining our property. 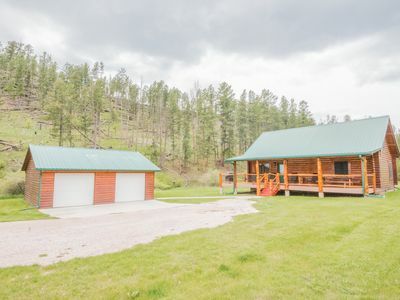 There are also numerous mapped and marked trails in the Black Hills National Forest and Custer State Park within an easy drive. The Mickelson trail access is less than one mile. We are happy to share with you those we've hiked or provide a source of information on those we haven't. 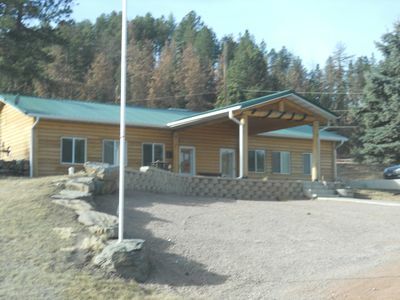 We find the Black Hills to be very accessible hiking for all ages and abilities. There are several public lakes in the Black Hills , mainly stocked with trout. Our nearest fishing ponds are within a half to one mile from Pine Rest and we are happy to point you in the right direction. Spring Creek runs through Hill City and Rapid Creek is popular for fly fishing. Major Lake is a small lake right across from the grocery store in Hill City. Sheridan, Pactola and Deerfield are the larger lakes nearest us. Temporary fishing licenses are available at the local gas station and hardware store. We do have a hot tub for older kids ( 12 & up) and adults, but no pool . You'll also want your suits to enjoy a sunny day at one of the area lakes. We are happy to point you in the right direction. Some of the marinas rent pontoon boats and fishing boats, or paddle boats and canoes. We are also happy to have the naturally heated indoor and outdoor pools at Hot Springs' Evans Plunge about an hour from us. 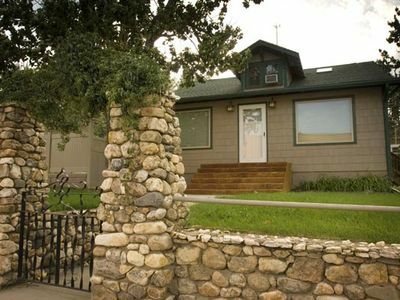 Custer, 11 miles, has a public pool and there are several in Rapid City - 27 miles. The Watikii Water Park in Rapid City, less than an hour from us, is also open all year. Our favorite swimming lakes with restroom facilities are Center Lake in Custer State Park, Angostura Lake near Hot Springs, and Sheridan Lake, just 7 miles north of us off of Hwy 385. Day use Permits or Park stickers are required for these swimming areas. 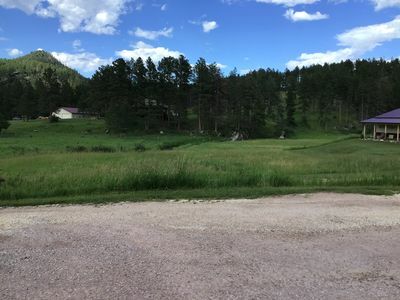 As with most private property situated within the boundaries of the Black Hills National Forest , we are right along the main road. 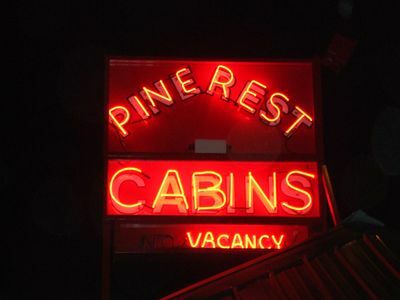 Pine Rest Cabins has three short gravel driveways, just off of highway 16/385 allowing quick and easy access for those who like to be out and about during the day and return in the evening to unwind. In the winter time our road is well maintained and very quiet. 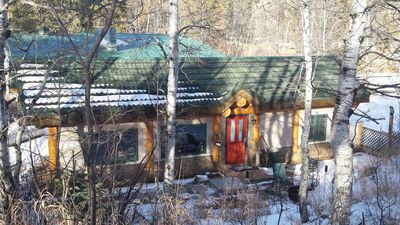 Our home for over 26 years, we love it here among the mountains and pines, yet having everything so handy. However, if you prefer to be further from it all, we understand. Let us know, and we'd be glad to link you to other possibilities that may better suit your needs. Being in the center of the national forest, we are cautious about open fires . Each cabin does have a charcoal grill. You are invited to use the chiminea at the bathhouse patio during low fire danger. We are located in the Black Hills National Forest Fire protection district and are subject to the rules and regulations thereof. WHERE CAN WE DO LAUNDRY? Laundromats are located at the two gas station/convenience stores - Conoco & Exxon - in Hill City. 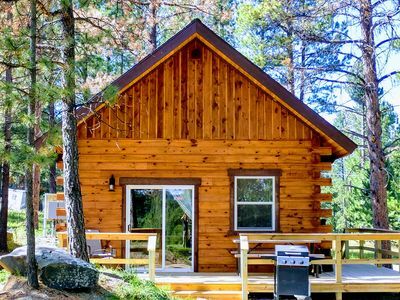 DO THE CABINS HAVE PHONES AND WI- FI? Wi-Fi signal is strongest in the Coffee Shop and at the Bathhouse Patio – you may have service you’re your cabin as well. There are no phones in the cabins. Be prepared for pockets with "no service" as you travel around the Black Hills. You may want to check with your service provider about your particular phone coverage and plan for extra data usage. It is good to remember that when a call won't go through out in the hills , sometimes a text will , and a paper map in the car is an old reliable method of navigation. 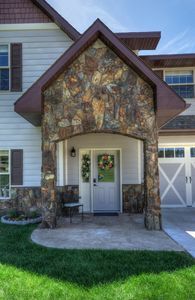 Spacious two bedroom condo centrally located in the Black Hills. Best spot to stay if you want to be close to everything!